My three words that will make 2018 successful is a campaign started by my 2017 business hero, Chris Brogan. In fairness to Chris, he calls his goal setting method, My 3 Words. I added the “That will make 2018 Successful” part. I hope he’s good with that. Keeping things simple is a challenge for me. How about for you? It’s easy today to sit down, get started working, have a plan and in five minutes be slipping down Alice’s rabbit hole. Squirrel! Shiny object syndrome. However you name it, can you relate? While working on Brogan’s method and idea, I admired the simplicity. His Owner Media Group that I joined this fall is the most worthwhile investment I’ve made in a long time and I recommend it highly. The content Chris and his business partner, Rob Hatch, create offer simple, action-oriented ideas and strategies. I’m grateful I found the resource and encourage you to check it out. Ok. Enough about my business crush on Chris Brogan. I learned about setting goals the first time I read “Think and Grow Rich.” After that, I’ve never missed a year. Sometimes it’s good to adjust goals at mid-year, too. The point is, goal setting works. I answered that I got close, but the world, and I, evolved and what I imagined wasn’t possible because the company no longer existed because of M&A activity in ophthalmology. What’s true, though, is that exercise laid a path and began a habit that is core to who I am. Do you have a story about your goals? It’s possible I laboured over these three words. Do you ever do that? You start thinking about something and all of a sudden it creeps into everywhere. 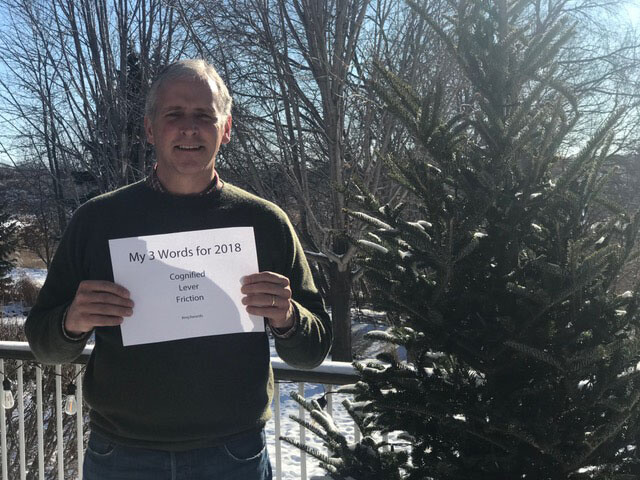 On the treadmill – what are my three words that will make me successful in 2018? In the shower – what are my three words that will make 2018 successful? Driving to the office…you get the gist. I wrote a review of this book last Spring. Also, I started a Podcast called Cognified Marketing and Selling on December 31st with the goal of 52 episodes in 2017. I did 8. Podcasting is hard work when you’re doing it all alone. My goal is to do 26 in 2018. Cognified, to me is about being smarter. Kelly said in his book that adding a little bit of intelligence to even the dumbest thing can have amazing effects. I believe this is true for me. Not that I see myself as a “dumb thing,” because I’m not. But sometimes I do dumb things, that’s for sure. In 2018, I will remember to ask myself, “Am I doing this as smart as I can?” And if the answer is,”No.” I’ll stop doing it. I love Archimedes quote, “If you give me a long enough lever, and a fulcrum upon which to place it, I may move the world.” Leverage came to mind as I was working on my three words that will make 2018 successful, but I like lever better. We use this term a lot in our business at Sightpath Medical as we think of “levers that we can pull to_______.” Fill in the blank. It’s not always easy to know what levers to pull, but it’s a good metaphor that ties nicely to cognified, too. I am grateful I’ve learned this through my association with smart Private Equity, finance and operations people. I’d like to use a lever to create value using the tech stack I’ve built and the connections I am making. Sometimes, the hard part is finding the fulcrum. Thinking about the lever and fulcrum relationship will help me stay focused in 2018. This is the word I struggled with the most. Ironic, I know. When there’s friction, there’s action. Whether it’s good or bad often depends on perspective and attitude. Brogan’s written about this lately and it resonates with me. He responded to an email I sent him about his weekly newsletter and used this word. That got me thinking. I avoid friction and try not to create it. Well, unless I’m finishing a piece of wood or sharpening a knife. Considering I almost never do the former and not enough of the latter, it seemed like a good, aspirational one of my three words that will make 2018 successful. A word I considered, that I believe relates to this, is “execute.” When I bring projects, commitments, ideas, and goals to anything less than completion it creates internal friction for me. I don’t think I’m alone here and want to find ways to deliver value by finishing. My nature is to create. When I don’t create, it causes personal friction. If I’m forced to slog through the mundane at the expense of time to create, I promise to get cognified, use a lever and look to reduce the friction. My friend Nancy Lyons, another business crush of mine from years back, recently created an engaging post on Facebook. I want to steal her idea here and iterate it just a bit. What Nancy did was posted a simple image and it said, “Ask me anything.” What ensued from her post was entertaining, humbling, educational and amazing. So in the spirit of Nancy’s wit, in the comments below you may either ask me anything or post your three words. Either one works. I work with doctors, salespeople, and marketing types who ask me often about my blog, podcast, social media activity and content creation. They mostly wonder, where do you find the time? It’s a good question and something I’m working on to help people. If you’re interested in some projects I’m working on to bring some value there, put your name and email in the box below. I’ll keep you updated on the progress of the projects and send you a weekly digest of ideas and strategies you may find helpful. As always, thanks for reading my work. I’m grateful you gave me a few minutes of your valuable time.